Custom black & white 60” arc auto open golf umbrellas are preferred choices for brand promotions for marketers who wish to create some strong impressions in a crowded market place. 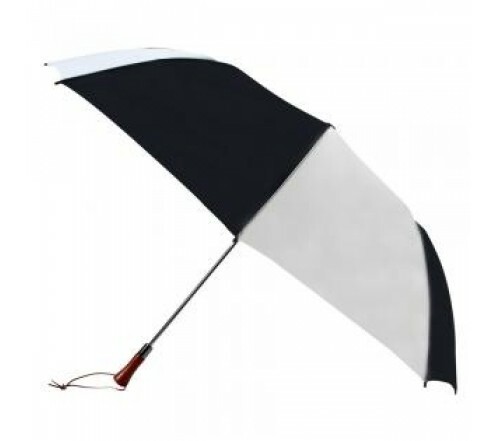 Logoed promotional black & white 60” arc auto open golf umbrellas are generally utilized by sports advertisers, and creative services to promote their business during packed art exhibitions or golf matches or other sports gatherings. This automatic open umbrella features steel windproof frame, black and white nylon fabric canopy, and a very sturdy handle, which keeps it upright even during harsh weather. Personalized black & white 60” arc auto open golf umbrella can be employed for indoor exhibitions, too. Dimensions - 60" arc - Closes to 22.5". Imprint area - 10"W x 8"H.